Office Space - North Miami Beach, Florida. 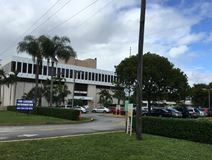 Situated in the very heart of the popular and vibrant North Miami Beach, this three-storey office building and corporate business venue was luxuriously renovated in 2005. Two of the floors are home to a wide range of law office executive suites and some of the most technologically sophisticated and commercially innovative facilities and services available anywhere in the region. A variety of sizes of space are available and the area offers great transport links also.